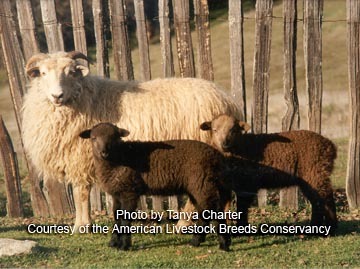 America’s first domestic sheep were small, rugged Churro sheep from Spain, brought by Francisco Coronado in 1540 and Don Juan de Onate in 1598. 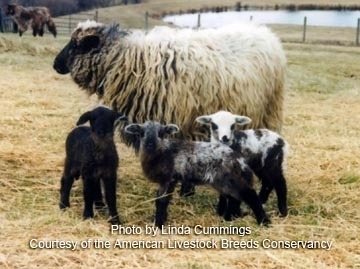 Sheep were used as a source of meat for the explorers and for the missionaries who followed and established a chain of missions throughout the region that is now Mexico and the southwestern United States. During the "Golden Age" of the southwestern sheep industry (1788–1846), master weavers from Mexico promoted their skills, and the trade in textiles and livestock was significant. In 1807, Zebulon Pike reported that a single flock of Spanish sheep could number 20,000. Southwestern Churros went down the Chihuahua and the Santa Fe trails and eventually all the way to California. Churro sheep found their way into the hands of Native Americans who used the sheep for meat but especially came to value the wool, a wonderful new material that was quickly adopted for production of textiles. Sheep soon became the basis for subsistence and trade in Hispanic and Native American economies. During this time selection for fleece character, coupled with the natural -selection of the challenging environment of the arid Southwest, forged the Navajo-Churro breed.